Florence, or Firenze as it's known to those who live there, was the cultural epicenter for Early Italian Renaissance art, launching the careers of many prominent artists in 15th-century Italy. In a previous article on the Proto-Renaissance, several Republics and Duchies in northern Italy were also mentioned as artist-friendly. These places were quite serious in competing with one another for the most glorious civic adornment, among other things, which kept a lot of artists happily employed. How, then, did Florence manage to grab center stage? It all had to do with five competitions among the areas. Only one of these was specifically about art, but they were all important to art. In most of the 15th-century (and 14th-century, and all the way back to the 4th-century) Europe, the Roman Catholic Church had the final say on everything. That's why it was of major importance that the end of the 14th-century saw rival Popes. During what is called the "Great Schism of the West", there was a French Pope in Avignon and an Italian Pope in Rome and each had different political allies. Having two Popes was intolerable; to a pious believer, it was akin to being a helpless passenger in a speeding, driverless automobile. A conference was called to resolve matters, but its outcome in 1409 saw a third Pope installed. This situation endured for some years until one Pope was settled on in 1417. As a bonus, the new Pope got to re-establish the Papacy in the Papal States. This meant that all of the (considerable) funding/tithing to the Church was once again flowing into one coffer, with the Papal bankers in Florence. Florence already had a long and prosperous history by the 15th century, with fortunes in the wool and banking trades. During the 14th century, however, the Black Death wiped out half of the population and two banks succumbed to bankruptcy, which led to civil unrest and the occasional famine coupled with episodic new outbreaks of the plague. These calamities certainly shook Florence, and its economy was a bit wobbly for a while. First Milan, then Naples, and then Milan (again) tried to "annex" Florence—but the Florentines were not about to be dominated by outside forces. With no alternative, they repulsed both Milan and Naples' unwelcome advances. As a result, Florence became even more powerful than it had been pre-Plague and went on to secure Pisa as its port (a geographical item Florence had not previously enjoyed). Competition #3: Humanist or Pious Believer? Humanists had the revolutionary notion that humans, purportedly created in the image of the Judeo-Christian God, had been given the ability for rational thought to some meaningful end. The idea that people could choose autonomy hadn't been expressed in many, many centuries, and posed a bit of a challenge to blind faith in the Church. The 15th-century saw an unprecedented rise in humanist thought because the humanists began writing prolifically. More importantly, they also had the means (printed documents were new technology!) to distribute their words to an ever-widening audience. 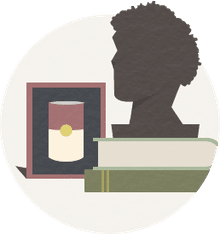 Florence had already established itself as a haven for philosophers and other men of the "arts," so it naturally continued to attract the great thinkers of the day. Florence became a city in which scholars and artists freely exchanged ideas, and art became more vibrant for it. Oh, those clever Medici! They'd begun the family fortune as wool merchants but soon realized the real money was in banking. With deft skill and ambition, they became bankers to most of present-day Europe, amassed staggering wealth, and were known as the pre-eminent family of Florence. One thing marred their success, though: Florence was a Republic. The Medici could not be its kings or even its governors—not officially, that is. While this may have presented an insurmountable obstacle to some, the Medici were not ones for hand-wringing and indecisiveness. During the 15th-century, the Medici spent astronomical sums of money on architects and artists, who built and decorated Florence to the total delight of all who lived there. The sky was the limit! Florence even got the first public library since Antiquity. Florentines were beside themselves with love for their benefactors, the Medici. And the Medici? They got to run the show that was Florence. Unofficially, of course. Perhaps their patronage was self-serving, but the reality is that the Medici almost singlehandedly underwrote the Early Renaissance. Because they were Florentines, and that was where they spent their money, artists flocked to Florence. Florence ushered in the 15th-century with what we'd now refer to as a "juried" competition in sculpture. 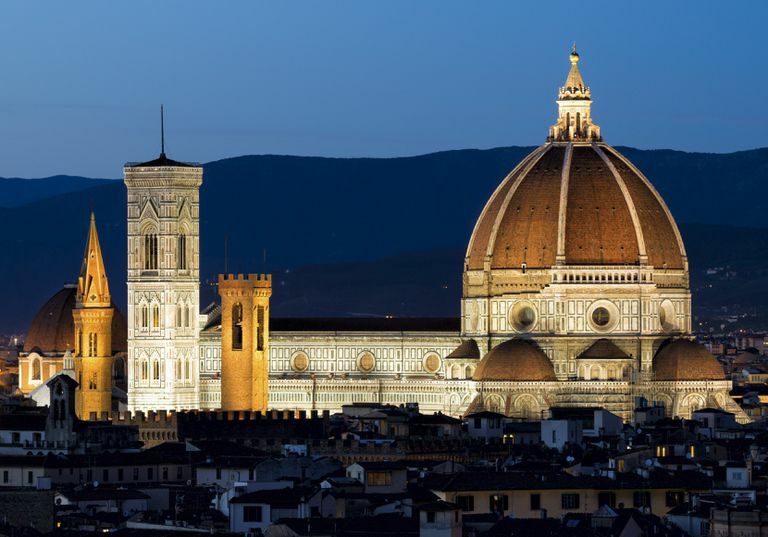 There was—and is—an enormous cathedral in Florence known as the Duomo, whose construction began in 1296 and continued for nearly six centuries. Adjacent to the cathedral was/is a separate structure called the Baptistery, whose purpose, obviously, was for baptisms. In the 14th-century, the Proto-Renaissance artist Andrea Pisano executed a pair of immense bronze doors for the east side of the Baptistery. These were modern wonders at the time, and became quite famous. Pisano's original bronze doors were so successful that the Florentines decided it would be a great thing entirely to add another pair to the Baptistery. To that end, they created a competition for sculptors (of any medium) and painters. Any talented soul was welcome to try his hand at the assigned subject (a scene depicting the sacrifice of Isaac), and many did. In the end, though, it came down to a competition of two: Filippo Brunelleschi and Lorenzo Ghiberti. Both had similar styles and skills, but the judges chose Ghiberti. Ghiberti got the commission, Florence got more impressive bronze doors, and Brunelleschi turned his formidable talents to architecture. It was truly one of those "win-win-win" situations, a great new development in art, and another feather in Florence's metaphoric cap. The Church, stabilized and unified once again under one Pope, provided artists and architects with a seemingly endless supply of subject material. Cities and towns always needed new or improved churches, and churches were always on the lookout for better works of art with which to adorn themselves. Important persons were forever passing on, and they required the appropriate final resting places (elaborate tombs). Florence coveted the finest of these churches and tombs. Florence, having proven itself at least equal to its neighbors, was not content to rest upon its laurels. No, Florence was determined to out-do everyone. This meant building, decorating, and embellishing what was already there, which meant plenty of gainful employment. Humanism, which found a welcoming home in Florence, gave some major gifts to the arts. First, nudes were once again acceptable subject matter. Secondly, portraits no longer had to be of saints or other Biblical figures. Portraits, beginning in the Early Renaissance, could be painted of actual people. Finally, the landscape, too, crept into fashion—again, due to the fact that humanist thought was broader than strictly religious thought. The Medici family, who (literally) could not spend all of their money if they tried, funded all sorts of artists' academies and workshops. The better artists that came and taught attracted even more talent until you could hardly swing a cat, as they say, without hitting an artist. And, since the Medici were keen on glorifying Florence, artists were kept busy, paid, fed, and appreciated... just ask any artist what a happy situation this is! Finally, the "door" contest made it possible, for the first time, for artists to enjoy fame. That is, the heady, dizzying personal sort of fame we usually reserve for actors or sports figures in the present day. Artists went from being glorified craftsmen to veritable celebrities. Small wonder that Florence launched the careers of Brunelleschi, Ghiberti, Donatello, Masaccio, della Francesca, and Fra Angelico (to name but a few) in the first half of the 15th-century alone. The second half of the century produced even bigger names. Alberti, Verrocchio, Ghirlandaio, Botticelli, Signorelli, and Mantegna were all of the Florentine school and found lasting fame in the Early Renaissance. Their students, and students' students, found the greatest Renaissance fame of all (although we'll have to visit with Leonardo, Michelangelo, and Raphael when discussing the High Renaissance in Italy. Remember, if art of the Early Renaissance comes up in conversation or on a test, paste a small (not too self-satisfied) smile on and confidently mention/write something along the lines of "Ah! 15th century Florence—what a glorious period for art!" What Does Your Italian Last Name Mean?